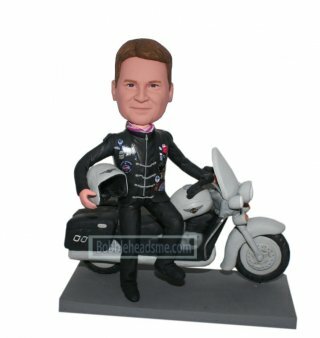 Custom Bobbleheads Male Racer In Uniform Laying On A Motocycle. If he's a classic car enthusiast, motorcycle lover, or extreme cyclist, give him his favorite vehicle in the form of a custom bobblehead! 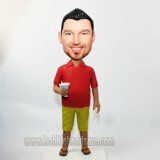 It'll get a laugh, be a unique decoration for his workplace or home, and remind him how much you care. Pick your favorite vehicle and upload your photos to customized vehicle and bring your bobblehead into a carefree road trip. Enjoy the night breeze and the windy sounds from the free speed way.